Just 18 days until Anand plays Kramnik for the title of World Chess Champion in Bonn, Germany. Below I continue with my preview for this historic match by examining a timeless game played by Kramnik in 1996. In 1996 Vladimir Kramnik played an exceptionally brilliant game as black verses a very strong opponent named Vassily Ivanchuk. Kramnik used fantastic opening preparation as well as brilliant tactical play to pressure Ivanchuk to error and finally resign. On move 6. Bg5 Ivanchuk initiates a Richter-Rauzer attack which provides the much needed tactical fuel for Kramnik’s fire. Kramnik move 14…Ng4 was a brand new idea that caught his opponent off guard. The move sacrifices the exchange but gives Kramnik long term pressure on the dark squares as well as some initiative to attack with. On 17. g3 Ivanchuk makes a small error which allows black to gain even more initiative. Ivanchuk should have played 17. Qf3. 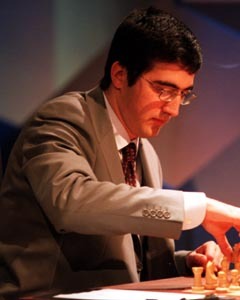 Kramnik’s 19…f5 was paticulary powerful and kept his attack going. On move 27 Kramnik makes a huge error with only five minutes left on his clock. I believe Kramnik should have tried 27…Qe7. To everone’s shock, Ivanchuk played 28. Nd3 which allowed Kramnik to win easily. This entry was posted on September 26, 2008 at 4:44 am and is filed under Anand vs. Kramnik, World Chess News. You can follow any responses to this entry through the RSS 2.0 feed. You can leave a response, or trackback from your own site.